1 of 2 In food processor or heavy plastic bag, crush graham crackers until fine crumbs. Transfer to small bowl. Stir in melted butter and honey until crumbs are evenly moistened. Transfer crumbs to four 4-inch springform pans (see Note), about 1/3 cup crumbs per pan, or to a 8-inch springform pan. Press crumbs evenly over bottom(s). 2 of 2 Bake in 325 degree F oven for 10 minutes. Transfer to wire rack. 1 of 4 In medium-size bowl, beat together cream cheeses until smooth. Add confectioners sugar, lemon rind and lemon juice; beat until thick and smooth. Add egg whites; beat until creamy consistency. 2 of 4 Divide batter evenly among crumb-lined pans, about 1/2 cup per pan, or scrape into large springform pan. 3 of 4 Bake in 325 degree F oven until top is set and smooth, about 20 minutes for smaller pans, 30 minutes for large pan. Transfer to wire rack; let cool until room temperature. Refrigerate at least 1 hour or until serving. 4 of 4 To serve, run thin knife around inside edge of pan(s). Release side; remove from bottom using thin spatula. Garnish with thin slice of lemon if desired. Serve chilled. 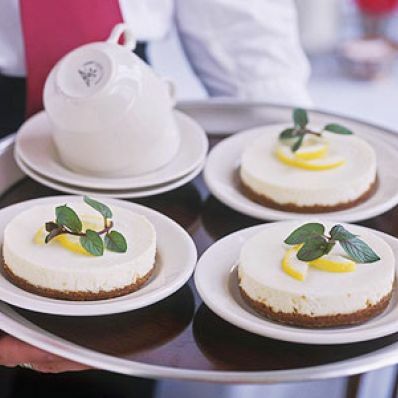 Makes four 4-inch cheesecakes (2 servings each).